Catwoman gives up Batman's location in order to effect a peace of sorts, with the condition that the Batman not be harmed. Regime Superman corners Batman, who is trying to bring heroes from another world to his own, but needs more time to do so. Story - 4: Every time this book drives me a lower than low rating, an issue like this takes place. One that is actually entertaining and enjoyable. Catwoman turning over Batman's location was foreshadowed... by the Injustice video game, and the idea of Batman hiding in lead mines is absolutely ridiculous. However, once Regime arrives, one can feel the pulse of the book finally shift from comatose to pounding. The green pill is gone. There's no magic, no lead-based smoke bombs, nothing standing between Regime and his long sought target. Alone, and with no possible way to escape, we know that the Batman will, but for this brief moment, Regime resembles the villain he once was. Until you remember that he's still talking to Batman and hasn't killed him. If Batman is the biggest problem that Regime has, and if he's truly gone over to the other side, then why is Batman still alive. I'll forego the meta-textual snark, and draw on the series internal's logic: Regime has killed every individual that has posed a problem to him. 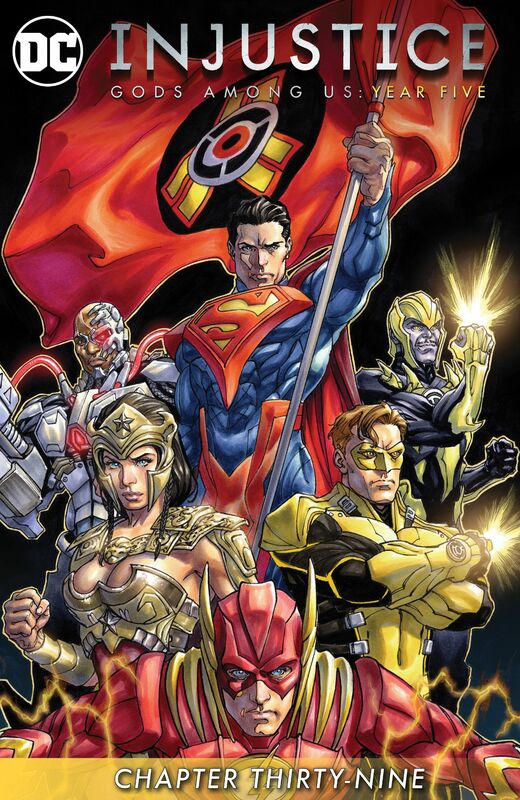 Kalibak, Martian Manhunter, Black Canary, Hawkman, even lowlies like Parasite and the demonstrators. 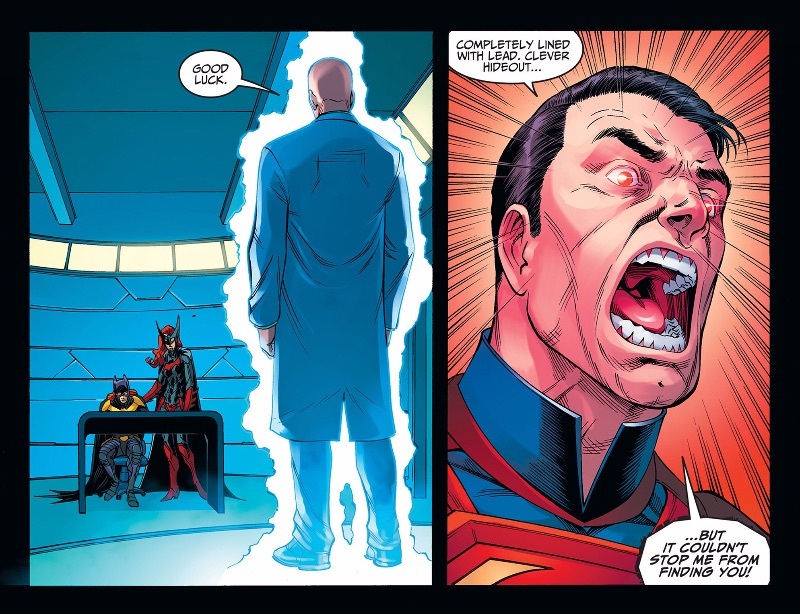 There is no reason for Regime to not kill Batman, and that is the biggest problem with Injustice; it is inconsistent with itself to the point that it challenges reading not only to ignore such clear apathy for its own story, but not to think as well. Art - 4: Page 18 stands out as an excellent composition. 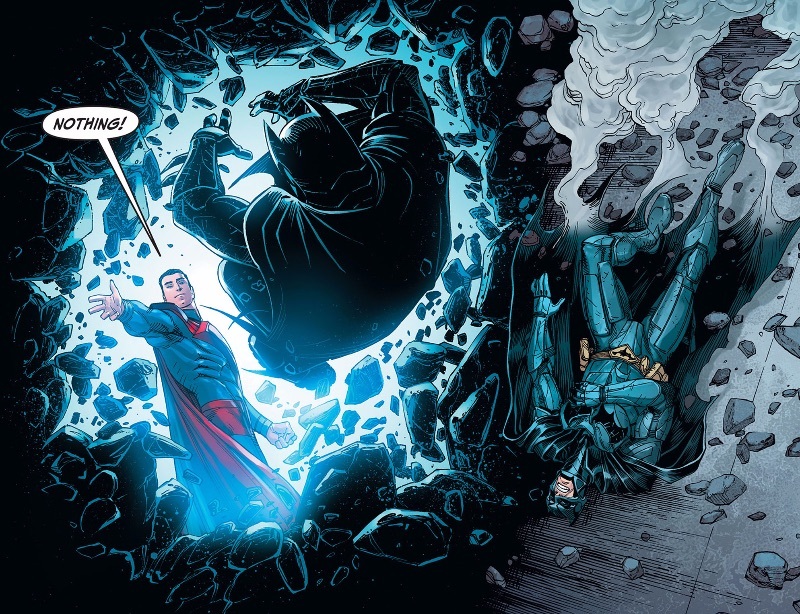 The balance between light and dark, between Superman's effortless countenance, while literally dashing Batman into the dirt speaks volumes about the animosity between the two.